I might be a little crazy, but I’m still standing behind salads as great and refreshing summer treats. And good in any season, really. 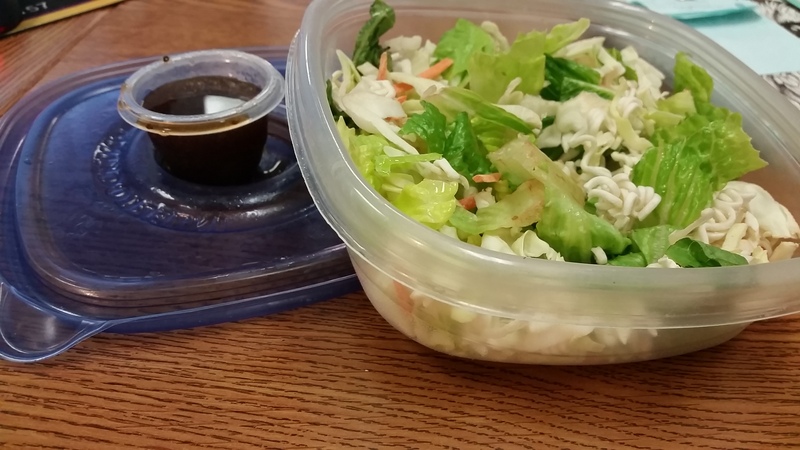 Ingredients: 2-3 cups lettuce/spinach/greens, 1/4 chopped cucumber, 1-2 shredded carrots, 1/4 cup dry and crushed Ramen noodles, 2-3 tbsp Sesame Ginger salad dressing, chopped green peppers and sesame seeds for taste. What I love about this salad is that it has a fun, almost Oriental taste. I find it to be a nice combination of fresh and sweet, without being to sticky-sweet. It’s a simple way to change up your greens and keep yourself from being bored with the same tastes! Enjoy!